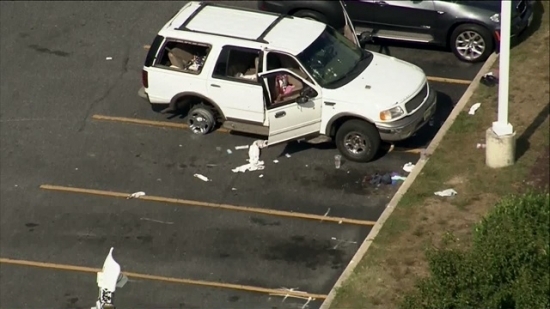 One person is dead and four people are injured after shootings in Egg Harbor Township, NJ this afternoon. New Jersey State Police and Egg Harbor police responded to the Wawa parking lot on Tilton Road in Egg Harbor Township, just off exit 9 of the Atlantic City Expressway around 3pm. Four injured people had driven to the store to find help in a bullet-riddled white SUV. It had its back window shot out, bullet holes in the sides, and the rear tire was shredded. They were taken to AtlantiCare Regional Medical Center's Atlantic City Campus. Authorities also responded to the call of another shooting victim in a car in the northbound lanes of the Garden State Parkway near Exit 38. That person was deceased. Authorities say that they have recovered some ammunition and weapons. They believe the shootings happened on the Atlantic City Expressway going eastbound and that it is an isolated incident between those involved. Authorities are trying to determine how they are connected and what led to these shootings. UPDATE: Tavarres has changed his mind and will stand during the National Anthem. A four alarm fire destroyed much of an over 100-year-old church in West Philadelphia Monday morning. Fire was first reported around 9 a.m. at the Good Shepherd Presbyterian Church on the 6400 block of Lansdowne Avenue. Two people were inside when it started but they got out without injuries. There was also a daycare in the back but everyone was safe. It took several hours to bring the fire under control. Over 120 firefighters and 40 pieces of equipment were on the scene. Firefighters worked hard to save neighboring buildings and homes. The cause of the blaze is not immediately known. The pastor says that five other congregations rent time in the church. He says that they will rebuild.